A 1963 Holiday took place around the country by driving around in your Volkswagen camper van. The Beatles couldnt seem to do anything wrong as everything went to number one. Hergé’s Adventures of Tintin first became an animated cartoon in 1963, and while the series was extremely popular in France and Belgium, it hardly aired at all in the U.S meanwhile Inspector Clouseau was introduced in 1963’s The Pink Panther. Who could forget the news headlines of 1963? The year JFK was assassinated and Martin Luther King Jr. Makes His famous “I Have a Dream” speech. While the Beatles were releasing new singles, new girl Cilla Black re-released an old Beatles song as her first single, helping to start her long singing career. 5 Gerry & The Pacemakers How Do You Do It? The first DR Who was broadcast in 1963 by the BBC. The show was restrained by the BBC’s low-budget purse strings, the special effects didn’t drop anyone’s jaw. But no matter how underwhelming the show’s look, no matter who was playing the doctor, the eerie title music, the unique narratives and those patented cliffhanger endings drew sci-fi fans for years. The big movies of the year had to be The Great Escape. But the all round cast of stars were involved in a chase accross America looking for lost treasure. Its a Mad, Mad, Mad, Mad World hit the cinemas at the end of 1963 and was a 3 hour movie that hit the box office. Other movies included Jason and the Argonauts Taking over four months to animate the famous “swordsmen vs. skeleton” climax scene, but proving worth every second. 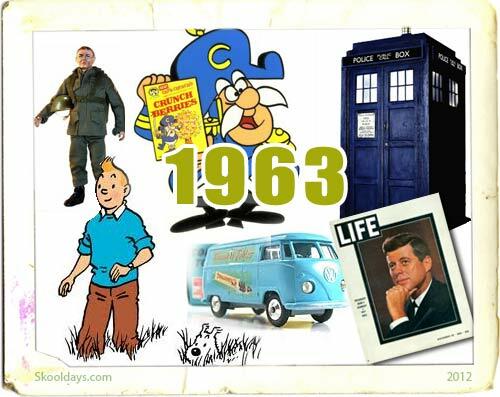 Yes dear Johny, 1963 was a great year…I was born in that year too! and just to play with a lot of these toys but in the mexican version (the same great american toy but all in spanish). The Mexican toy company Lily-Ledy and Plasty-Marx were encharged of made the toys in Mexico, those were the days!!! My G.I. Joe from 1970 is still alive!!! !